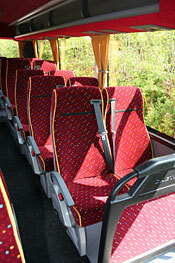 All mini-coaches have "Fainsa" high-backed moquette seats (some with arm rests). 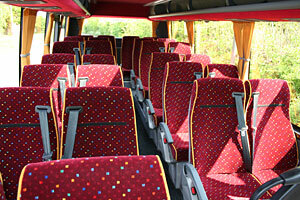 All seats have ventilation control, individual reading lights and retractable 3 point seat belts. An additional seat is available for a guide/crew. 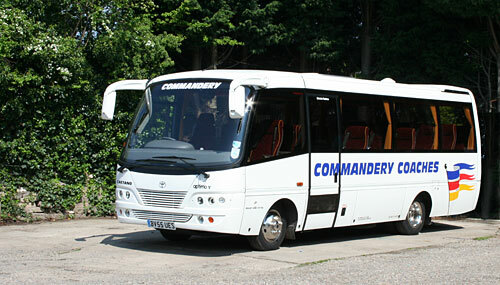 The complete fleet of 16 to 26 seat coaches are from the award winning Luxury Toyota Optimo 5 range. These vehicles are not van conversions but are purpose built coaches with ride quality and comfort as "design features". Full heating is provided with climate control which warms the interior to normal working temperatures. Side draw curtains are present for privacy together with tinted glazing. Carpets are provided to the gangway and entrance steps with a soft trim interior moquett to side walls and roof. F.M. radio/cassette. P.A. System. Hot drinks unit. Power operated door with -wide low level entrance.